And it's coming to the PlayStation 3, the PS4, the Xbox 360, the Xbox One, and PC in glorious high definition. According to Famitsu, this is an HD remastering of the 2002 remake, with the goal of keeping the game's sheer terror. Capcom assures that it isn't making any unnecessary changes to the game that will compromise the experience. Besides enhanced sound, the HD remaster polished and reworked the graphics so they look better—you know, remastered. The game features both widescreen support and 4:3, and players can switch between the two while playing in real time. In widescreen, players can also use a scroll function, as sometimes background elements will be cut off in widescreen. The remake comes with a dual control scheme as well—there's the classic controls, as well as a newer control scheme, in which the character moves in the same direction as the analog stick. 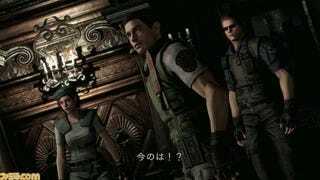 Resident Evil HD Remaster will be released on the PlayStation 3 and Xbox 360 on November 27 in Japan. The PlayStation 4, Xbox One, and PC versions are slated for early 2015. Update: In an official release, Capcom announced the game for all the same platforms for an early 2015 release in the West.